We’ll by the time you read this, you’re season will pretty much be done. There will be a few spots to still ride in Canada, but for some of you, your next ride will most likely happen in the US. When the snow starts to fly, it’s a sure sign that it’s time to move from the track into the gym to stay in shape or to get in shape for next season. In the last issue of MXP Magazine, I discussed how long your strength-training workouts should be in order for you to achieve maximum results – we looked at what happens to Testosterone and Cortisol if you train with high intensity for more than 60 minutes. This issue, I’m going to discuss the protein needs of the body and in particular how to recover from training so that your strength and conditioning can continue to improve. Protein takes on many roles in your body. It is responsible for growth and maintenance of your body (in particular your muscle); enzymatic and hormonal functions; creating antibodies (fighting infection), as well as balancing and regulating fluids and electrolytes. Proteins are also used to help maintain an acid-base balance within your body while having the potential to be used as energy if and when your body requires it. All proteins are made up of smaller building blocks called Amino Acids. There are 20 different amino acids, that when combined will form the structure of a protein. In order for a protein to be used in muscle recovery or other functions, it must contain all nine Amino Acids that are classified as essential. Essential Amino Acids are Amino Acids that the body cannot make or produce itself. They must come from external food sources or supplements. Foods that contain all 9 Essential Amino Acids are called complete proteins. Foods that do not include all 9 Essential Amino Acids are called incomplete proteins. Foods that are complete in Essential Amino Acids are listed below. Eating any of these foods, will guarantee that you are getting all 9 essential amino acids. These incomplete proteins must be combined with one another or with a complete protein if they are to be used effectively and efficiently within your body. For instance, bread is an incomplete protein when eaten alone, however when combined with peanut butter the two create a complete protein. The same would hold true for a stir fry that contained vegetables and tofu. A strong rule of thumb for hard-training athletes should be eating approximately 1 gram or protein per pound of body weight per day. This can go up or down depending on the person’s exact metabolism. I have worked with athletes that have responded very well to 1.5 grams of protein per pound and as low as.8 grams during high-intensity training phases. Individual tolerance to eating a high amount of protein however does need to be assessed in the early phases of adjusting any diet. Protein is one of the harder macronutrients for the body to digest, so some experimentation needs to be done to settle on exact levels for each individual. 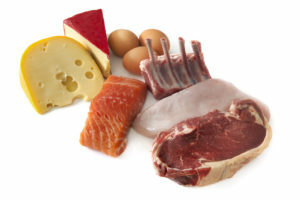 So if you are looking to gain some functional muscle, like many younger athletes that are graduating to bigger bikes, you will need to eat enough protein to satisfy your target weight. If you are 135 pound, but need to increase to 150 pounds, you will need to eat enough protein to achieve the 150 pounds. In essence you will need to consume at least 150 grams of protein each day (1 gram per pound), with an upper limit of 225 grams per day (1.5 grams per pound). Conversely, if you are looking to lose some weight to be lighter on the bike you will need to adjust your protein intake down. If you weigh 175 pounds but want to be 155 pounds, you will need to drop your protein accordingly to 155 grams to 230 grams per day.